https secure pages required by Google in October 2017 – You might be thinking, what’s that supposed to mean? Well, Google has been sending out email messages to all people who own a site, each warning the same thing- that their site will be considered “not secure”, starting in October 2017, with the release of the new Chrome 62. The only way for it to be considered secure again is if you change the URL to https. This is the more “secure” version of HTTP. Weird, right? If you have ever browsed in Incognito mode using Chrome or Google before, it seemed that your information would be private and secure. Not so, starting in October. 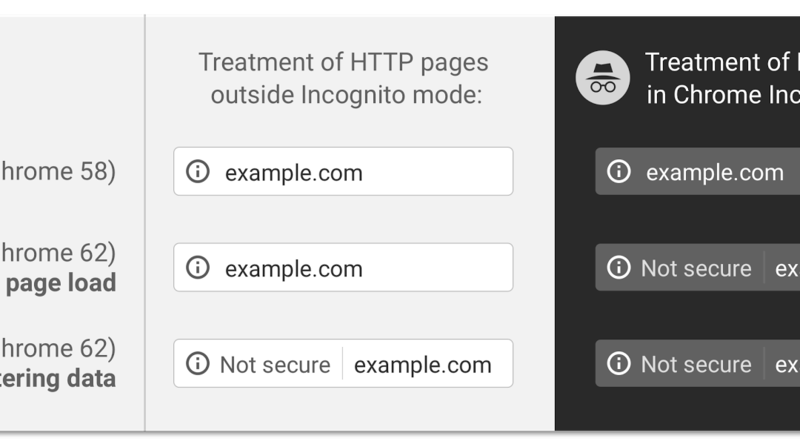 From now on, anytime you browse in incognito mode, Chrome will warn you that HTTP connection is not secure and your passwords or credit card or any other info that you might not want public may not be safe and might be visible to others on the network. Chrome will soon be posting the warnings of “not secure” sites on all HTTP websites, not just incognito mode. So, if you are the owner of a website and you would like to prevent your customers, who use Chrome to access your website, from seeing that message of “not secure” page, you might want to start checking out the process and steps of what you need to do turn your page into an https. There is no other way around this since all data entered into and submitted on HTTP page can be viewed, altered even captured by third parties during the transmission process. Chrome is trying to resolve security problems by having secure https websites. You can also register and apply for an SSL security certificate and that will also resolve the issue. I strongly encourage you to change your website to use secure https as soon as possible, as this will benefit you in the long run. Google Chrome will publish updates as they approach future releases but please don’t drag your feet and get started moving your websites to https, this will put you a step ahead of most people! To secure your site, contact RyePoint today!